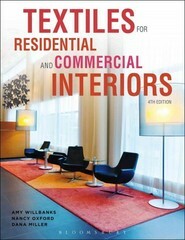 Textiles for Residential and Commercial Interiors 4 Edition Devoted entirely to textiles for interiors, Textiles for Residential and Commercial Interiors, 4th Edition, focuses on the most current fiber and fabric information including new fiber technology and nanofibers, the role of the interior designer in selecting textiles, and the environmental impact of textiles. The book includes in-depth coverage of household and institutional textiles, in addition to commercial and residential textiles for upholstered furniture, windows, walls, and floor coverings. Full-color line drawings and photographs illustrate fibers, yarns, fabrics, manufacturing equipment, coloring, finishings, and end products. Textiles for Residential and Commercial Interiors provides students with all of the technical information, aesthetic fundamentals, and practical knowledge they need to select textiles for every type of residential and commercial interior.